LISBON — In 2009, Ross Cunningham, then a member of the Lisbon Revitalization Committee, was speaking with local musician Brian Patricks and music storeowner Tom Dube at the Moxie Festival during a Friday night festival concert. They all agreed that Lisbon needed more live music on a regular basis. That year, with the support of the Economic Development Office, Cunningham launched Lisbon Concerts in the Park on a 10×10 plywood platform under a pop-up tent in MTM park. Four bands played for free and roughly 20 to 40 people came to the shows. In 2010, fundraising began for a more official stage, and the MTM Pavilion, a 16×20 post-and-beam stage, was built with the financial support of The Kelly Family and the Lisbon Community Federal Credit Union and the volunteer work of the U.S. Navy Seabees, lead by BU1 Jeff Dwyer. This past week, Lisbon Concerts in the Park, now a subcommittee of Positive Change Lisbon, completed their 10th season of free outdoor concerts in Lisbon. Over 1,000 people attended a performance by Yellow Brick Road, a tribute to Elton John. 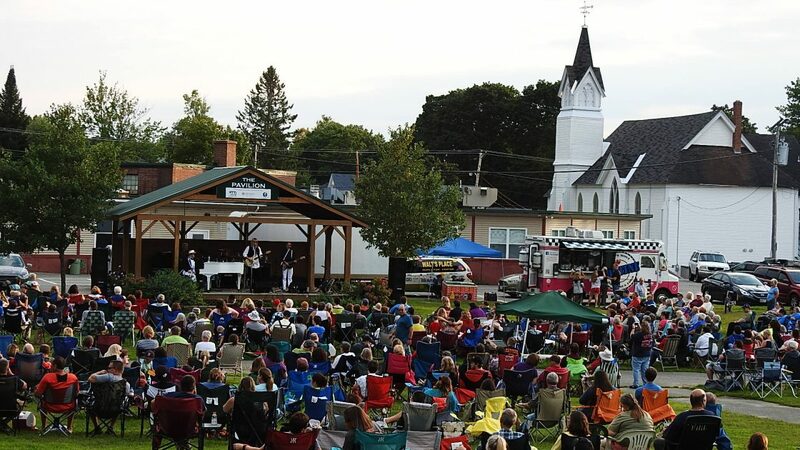 Over the last 10 seasons, Lisbon Concerts in the Park, with the support of over 130 business sponsorships, has held 75 concerts with over 50 different musical acts. The community has embraced the tradition and invested in a brand-new playground in 2017 that is full of laughter and activity during every one of these shows. Positive Change Lisbon President Angie D’Amours reflected on the impact on the community. “The Concerts in the Park have really increased community connections in the last 10 years. There’s truly something for everyone: great live music, new play area for the kids, local food trucks, all in a great neighborhood setting. It’s a wonderful opportunity to catch up with neighbors and friends and to invite other communities to visit Lisbon.” Cunningham is optimistic that this tradition of live music will continue to grow in Lisbon. “We are contacted each spring by bands eager to play on the Pavilion stage. With the proposed addition of a performing arts center at the high school and the popularity of these outdoor concerts, we are positioned to become a performing arts destination.” This article is provided by the Positive Change Lisbon press team. For more information on PCL, please visit our website www.positivechangelisbon.org or like us on Facebook.